Elder David A. Bednar of the Quorum of the Twelve Apostles, and his wife, Sister Susan Bednar, will be the featured speakers at the RootsTech Family Discovery Day 2019 on March 2, 2019. Watch the online stream from anywhere in the world. Watch the live stream on LDS.org March 2 at 9:30 MST. Watch live or recorded sessions on LDS.org. Are you passionate about family stories? Do you have an interest in learning how to discover your roots? If so, Family Discovery Day 2019 on March 2, 2019, is for you. Attend the event or watch the live stream on LDS.org from anywhere in the world. Elder David A. Bednar of the Quorum of the Twelve Apostles, and his wife, Sister Susan Bednar, will be the featured speakers at RootsTech Family Discovery Day, a free one-day event designed to help LDS individuals and families discover gather, and connect their family heritage—past, present, and future. Family Discovery Day, which originates at the RootsTech family history conference in Salt Lake City, Utah, will be streamed online on the home page of LDS.org beginning at 9:30 a.m. mountain standard time and on lds.org/familyhistory in English. Members of the Church around the world are invited to participate. If you can’t watch the live stream on March 2, videos of the messages from Family Discovery Day will be archived at lds.org/familyhistory for later viewing, with closed captioning in English. Individuals and families interested in attending the live event Saturday, March 2, in Salt Lake City should register online at RootsTech.org. In addition to attending the general session featuring Elder and Sister Bednar, you can enjoy several classes and fun, interactive activities geared to help you discover and celebrate family traditions, learn about the latest family history tools, technology, and resources, and get help with your calling. 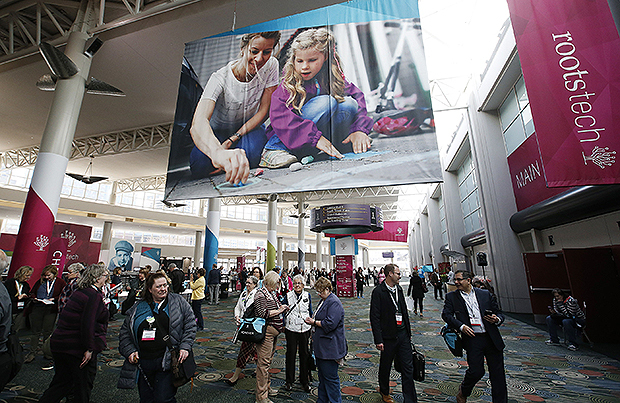 RootsTech attendees walk through the convention in Salt Lake City on Friday, March 2, 2018. Photo by Jeffrey D. Allred, Deseret News. Sister Joy D. Jones encourages members to get their children involved with family history and temple work early during the Family History Leadership Session at RootsTech on March 1, 2018. Photo by R. Scott Lloyd. President Dallin H. Oaks, First Counselor in the First Presidency, holds up the journal of one of his ancestors during the keynote session of RootsTech Family Discovery Day in Salt Lake City on Saturday, March 3, 2018. Photo by Jeffrey D. Allred, Deseret News.